Two firefighters died battling to save a woman trapped in a burning 14th storey flat, which was filled with black smoke, an inquest has heard. 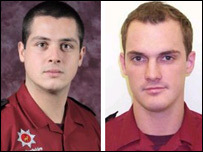 Firemen Jeff Wornham, 28, and Michael Miller, 26, were killed in the fire along with mother-of-two Natalie Close. Mr Wornham died after becoming entangled in cables in the lobby of the flat in Harrow Court, Stevenage, Herts. Mr Miller was found inside a bedroom, near to the body of Ms Close, 32, Hatfield Coroner's Court heard. The two firefighters were among the first to enter the block of flats, with breathing apparatus, breaking-in equipment and a hose reel. The Fire Brigades Union (FBU) has claimed their deaths, believed to be the first time in 30 years a firefighter has been killed in a fire in the county, were avoidable. They were not carrying bolt-cutters which would have enabled them to open the water supply on the floor. The hydrant was secured with metal chains due to repeated vandalism. On the ground floor another firefighter used bolt-cutters to break open a similar hydrant by the entrance which controlled the water flow to the entire building, the inquest heard. Giving evidence resident Nicholas Savage, 39, told how he woke up to find a small candle burning out of control in the early hours of 2 February, 2005. He said: "I took some breaths of fresh air. That revived me but it started getting hotter and hotter. I started panicking. "I thought 'I'm not going to burn'. "I got out of the window and I was hanging there out the window about a minute and a half." Mr Savage said he shouted at firefighters as they arrived, and minutes later he was rescued. Mr Miller's body was found by a second wave of firefighters inside the bedroom of the flat with that of Natalie Close, 22. Mr Wornham had become entangled in fallen plastic cables in the lobby outside the flat. Hertfordshire Coroner Edward Thomas said both firefighters died from "acute thermal injury" and Ms Close died from smoke inhalation. The inquest, which is expected to last two weeks, continues.